Jonathan has worked to preserve the sound of the original swing era, and pre-bebop jazz guitar. Jonathan specializes in the rhythm guitar style of Freddie Green, the chord melody style of Allan Reuss, the gypsy-jazz style of Django Reinhardt, and the electric guitar style of Charlie Christian. Stout runs an extremely informative and well-written “Swing Guitar Blog” (“Dedicated to Pre-Bebop Jazz Guitar”). Lots of interesting stuff on swing harmony, essential swing CDs, essential rhytm guitar voicings and much else, plus some fascinating discussions of how radically different bebop really was/is from swing — rather than the logical continuation of swing that some musicologists have claimed. Yup; that’s right; here it is. This is one of John D’Angelico wartime upgrading jobs. Not a 100 % authentic D’Angelico, to be sure, but a very pretty player. And buying it will bring you a little extra, because in the guitar case “There’s a box containing a somewhat dried out fake nose, complete with box, copyright 1961, titled “The Snoz” – “Most natural looking of all” – with the instructions: “When smoking the smoke can be blown thru nose holes to make it look real.” How about that? Is it just me, or are jazz guitarists routinely treated in a cursory and inaccurate manner in jazz encyclopedias? Leonard Feather, for a very long time the reigning king of jazz journalists, began this tradition by dissing Django Reinhardt in a rather silly manner. Remarks like “jazz guitar basically didn’t progress beyond Charlie Christian for more than 25 years after his death” are unfortunately rather standard in many books on jazz history. So, what do you give the rookie who wants an accurate primer on jazz guitar? I think this internet piece by Dr. Matt Warnock may be it. It is fair, accurate and balanced. Of course, one can always disagree with his specific choices (e.g., I would have picked Tal Farlow or Jimmy Raney instead of Johnny Smith), but overall this is a good introduction. What are the three biggest stumbling blocks for developing guitarists? GB: Ah, the kids don’t really know what jazz is and they haven’t listened to a lot of real good music. And their chord knowledge is nil. Because you can play rock with three or five chords. And to watch them get into it and develop is like a real thrill. Chord structures are very important; harmony is very important. Theory, and that’s something musicians use to always learn thirty and forty years ago. But they don’t learn that way today. Many, many guitarists have done their first strumming on some cheapo Harmony guitar. According to the Wiki on Harmony, “The company hit a peak in 1964-1965, selling 350,000 instruments, but low-end foreign competition led to the company’s demise 10 years later. Between 1945 and 1975, the Chicago firm had mass produced about ten million guitars.” Apparently, many people still harbor nostalgic feelings for the craptops of yesteryear, and here is a fancy website belonging to an Asian operation , “The Original Harmony Guitar Company, Inc.” (It is not transparent how old this producer is, but this indicates that it may be three decades old or more). 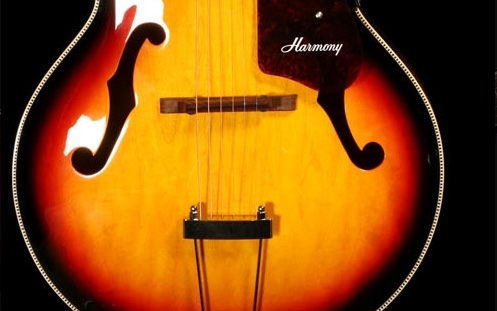 The company produces a series of replicas of the good old Harmony guitars, as well as a new series that does bear any particular resemblance to the vintage models (and some look quite decent, e.g., this one). The pricing policy is essentially the same as the old company, i.e., very low priced guitars. Ah, and while we are at Harmony, here is “The Harmony Database.” Very informative! It was, for example, new to me that Harmony had produced for Gretsch. The Zeidler Project archtop. What a fantastic creation. And a noble cause.